This nice and friendly restaurant is located in Pantai Cenang. As you walk along the main road in Cenang, you wil find this cozy restaurant next to the Putumayo store. When you look at the board, it says 'Rose Tea 2'. I still wonder why the number 2 and where might you see 'Rose Tea 1'. But it's been a nice find in a place like Pantai Cenang which is full of restaurants. While the cuisine here is Thai, it has an innovative touch of its own. If you are looking for very spicy hot seafood, then this may not be the place for you. In fact the owners have somewhat toned down the spices and richness of the food to suit tastes of foreign tourists. But having had the food here several times, I can say that the preparations are good although the portions could be larger. Overall ambience is relaxed and friendly. The restaurant is clean and so are the crockery in which the food is served. There is an outside patio with outdoor seating. Inside there are tables that have wonderful view of the Pantai Cenang Beach and the ocean.Lots of items in the menu. You can start with some salads like mixed seafood, prawn, squid or beef salad (ranging from RM10 to 15) or a soup (you get in two portions - small and medium, ranging from RM12 to RM20). But if you like spicy soups, then go for the Tom Yam seafood or prawn soups. They are excellent and served in three different portions - small, medium and large. In Tom Yam you will get other variations also like chicken, beef, squid, mixed seafood etc. Depending on what you order, prices for medium portion varies from RM25 to RM35. Another great preparation here and one of our favorites is the green curry which comes with choice of vegetables, chicken, prawn, mixed seafood etc. Prices range from RM14 to 20. In main courses there are range of dishes in beef, fish, vegetables, squids, prawns, crabs, fried rice etc. Most items come in different portions like small, medium and large. Some of our favorites includes the steamed lobsters, fried chicken with garlic & pepper, fried crab with chili paste, prawn fried rice etc and accompanying them with a chilled beer. Chicken, beef, fish and crab dishes (medium portion) range from RM20 to RM30. Beer is quite cheap (RM4 - 6) per bottle. They also serve wine by the glass. You can also get fresh fruit juices. 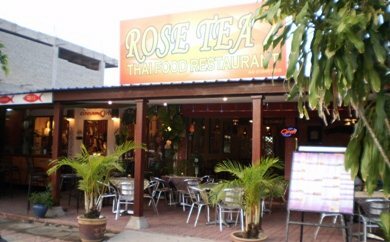 Overall it has been a satisfactory experience for us whenever we went to Rose Tea Restaurant. Open for lunch and dinner. Closed on Fridays. 1054, Jalan Pantai Cenang, Langkawi.